In today’s dynamic world a career in finance can be very exciting, rewarding and remunerative. The field of finance has never been so vibrant in the past where the finance wizards are experimenting tirelessly on structuring interesting products, devising more efficient way of transferring risk to other parties and unlocking the value hidden in various tangible, intangible and intellectual assets. Depending on your interest you can pursue a career in Commercial banking, Investment banking, Project finance, Corporate finance, Hedge funds, Private Equity & Venture capital, Insurance, Audit etc. In this article we’ll discuss how you can build a career prospect in Corporate Finance. Corporate Finance primarily deals with the appropriate allocation of financial resources of a company, arranging funds for various projectswith lowest possible cost of fund and to maintain the capital structure of the company. The corporate finance manager aims to maximize or increase the shareholders’ value. A career in corporate finance means you would work for a company to help it arrange funds to run its business, expand the business – organically and inorganically, chart the company’s future financial roadmap and manage the cash efficiently. As a corporate finance professional you are expected to deal with finance providers, lawyers, researchers and other key professionals. One might get to work with a large multinational company, a domestic leading group or even a relatively regional player with high growth prospects. Along with good academics, your commercial awareness and problem-solving skills might get you quickly in corporate finance jobs. Sounds exciting? Let’s understand the different steps or processes of corporate finance and why it’s such a lucrative career prospect for finance professionals. Remember, as a beginner in the corporate finance field, you might be involved with any of the following processes and can move to other process to gradually develop a macro view. 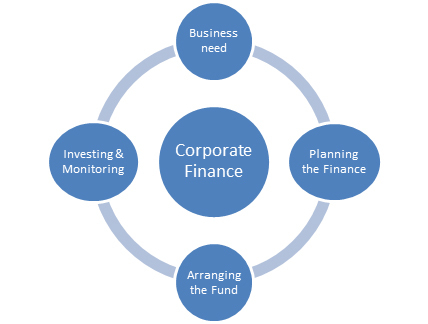 Corporate finance broadly comprises of four steps – identifying the requirement, planning the finance, arranging the fund, investing and monitoring of fund investment in order to achieve the financial goal of the company. How much finance is required by the company? What could be the nature and sources of finance? How much will be financed with equity (internal fund of the company) and how much debt is to be raised? How to use the finance profitably? Arranging the funds: The manager can choose to arrange the funds from many sources, viz., equity/ shares, debentures, banks borrowing, borrowing from other financial institutions, hybrid debt etc. Key considerations should be the cost of fund from various sources – bank debt is a cheaper source than equity, capital structure of the company, and tenor of finance to match the nature of requirement – long term finance for long term need etc. Investing and monitoring the finance: The finance manager then uses the fund raised in a phased manner to achieve the objectives of the company. She has to control and manage the fund to minimize cost overrun, and ensure maximum return for stakeholders. Managing the finance requires a systematic approach along with a fine sense of judgment. So, where can you fit in? Being a finance enthusiast you can explore two separate areas in the domain of corporate finance. The first is within a company or a group, where you can work on a wide variety of internal projects of the group pertaining to its various financial requirements. For example, you might work with Reliance Group in the next oil exploration mission in Africa or buying a stake in some shale gas exploration company in America. The second area is the possibility of working in the commercial and investment banking field. You can get opportunity to work for domestic banks, MNC banks, or consulting firms which are primarily involved with large corporate houses to small scale industries (SMEs/ MMEs). The corporate finance divisions of these banks serve the financial needs of corporate clients by providing financing for setting up a unit or working capital to run the day-to-day operation, consulting services for investing options and cash management services to maximize the return for the client etc. In terms of particular work profile that you may get into can be numerous. Truly speaking the variety of activities or different exciting job profile that one can explore in corporate finance is very wide. It may range from accounting, reporting, audit support which are few basic profiles, you can get involved with complex and demanding opportunities like budgeting, forecasting, treasury functions, merger & acquisitions, business development and strategic planning. In our next blog-post we’ll discuss few of these profiles in details, including the type of deliverables you’d be expected to work, the kind of skill-set required to get into these profiles and how you can work towards achieving those skill-sets. Previous This is the job you have all been waiting for!